I've always liked Beef Stroganoff and since I've been making the same old same old rice + meat for dinner this the past week (lack of creativity I suppose), I decided to shake things up a bit! And considering the lack of posts, I wanted to document this! 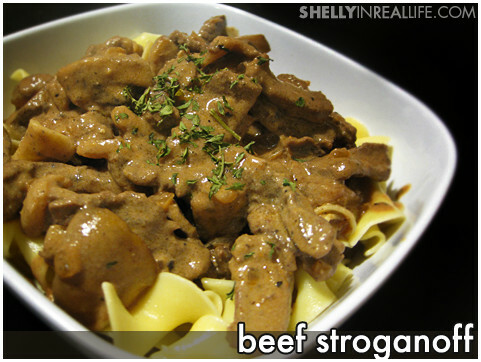 Beef Stroganoff is essentially the beef+sauce on top of egg noodles. So to start things off, begin making the egg noodles by boiling some water as you prepare the sauce. Make sure you salt the water with 1 teaspoon of salt, as this is the only time you can really give flavor to the pasta itself. Preparing the Beef Strips: first partially freeze your beef so it's easier to cut. This tip holds true to cutting any type of meat/fish thinly without it getting too mushy. Also, no one likes a chewy piece of beef, so in prepping the beef strips for your Stroganoff, make sure you slice your beef against the grain (the white strands of muscle + fat in the beef). This is essential as it keeps your beef easier to chew! Once you do all your prep work (quarter the mushroom + dice the onion), you can start with the sauce. 1) Cook your mushrooms: Heating up 1/2 teaspoon of vege oil in medium high heat and throw in the mushrooms and cook until it is lightly browned, about 5 minutes. As the mushroom is cooking, use a paper towel to soak up all the water from the beef and lightly salt & pepper it. Set the cooked mushrooms aside. Start cooking your egg noodles, if you haven't already. 2) Cook your beef: Now, add another 1/2 teaspoon of vege oil, let the pan heat up and put in your beef. Stir frequently and make sure it doesn't overcook. Cook it for about 5 minutes, and set it aside with the mushrooms. Even if the beef is still a tad pink, it is okay because as the meat sits, it will continue to cook. 3) Deglaze pan w/ wine: In the same pan, use about 1/4 cup of red wine to deglaze the brown bits that the meat left. 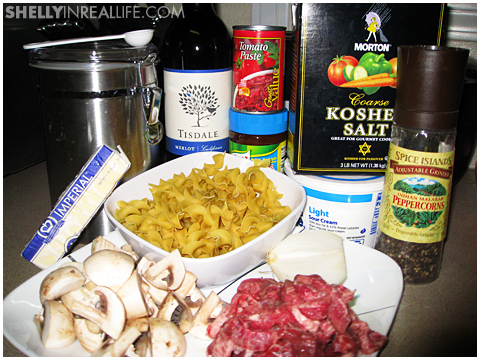 Cook until it reduces by half (shouldn't take too long), and pour that wine into the bowl of beef + mushrooms. Now, this is where my pictures ended because the recipe became a bit more hectic! 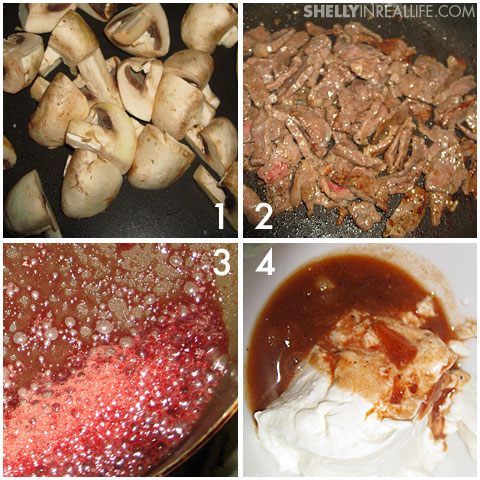 After heating up the mushroom + beef, you can make the rouge for the sauce. 3a) Brown the onions: Toss in 1 tablespoon of butter in medium heat, and put in the onions and garlic, 1/2 teaspoon of tomato paste and 1.5 teaspoon of brown sugar. 3b) Drain the pasta: As this is heating up, drain your pasta, put it back into the warm pot and add toss the pasta with the remaining 1/2 tablespoon of butter. Set this aside. 3c) Thin out your sauce: As your onion begins to lightly brown, add the 1/2 tablespoon of flour. This will create a paste-like sauce, to which, you will slowly add the 1/4 cup of water & chicken bouillon as well as the 1/4 cup of the remaining wine. Thinning out this paste with liquid creates the sauce! Let the flour thicken up about 2 minutes. 4) Add sour cream:Throwing in the sour cream into the hot boiling sauce will make it clumpy + gross, so to fix this problem, stir some of the hot sauce into 1/4 cup of sour cream. Thin it out slowly, and then add it back to the sauce. 5) Add mushroom + beef: Put the mushrooms and beef into the sauce and let it heat up for a few minutes, avoid overcooking as the beef gets tougher the longer you cook it! 6) Put it together: Season the sauce with salt + pepper. Serve over egg noodles. Garnish with parsley. I thought it needed some spice, so I also topped mine off with crushed red pepper flakes. While cooking this dish, I thought that it seemed like a long process, but believe me, it is well worth it! The end result is great, and writing everything out was actually harder than doing the actual cooking.